Review: 'Aldair in Albion', by Neal Barrett, Jr. The story is related in the first person by Aldair, who is (when we meet him) a student in a primitive community reminiscent both of the northern Roman frontier and of medieval European college towns. It is immediately revealed that Aldair and his compatriots are not human, although they believe themselves to be. There are also references to forbidden ruins and mysterious godlike forerunners. In other words, Barrett makes no secret from the outset that he’s working another variation on the Genus Homo/Planet of the Apes theme, and that he doesn’t expect the climax to be nearly as big a mystery to the reader as it is to Aldair. But it doesn’t matter, because the interest in the novel is not on what will happen but on how the events will affect Aldair and his friends. DAW Books, May 1976, paperback $1.25 (205 pages); Kindle $3.99. Frontispiece by Josh Kirby. The above review was originally published in Delap’s F&SF Review #20, November 1976, page 29. Aldair in Albion was one of the first s-f novels recommended around the “Gallacci groups” that gathered around Steve Gallacci at s-f and comics conventions in the early 1980s that led to the formation of Furry fandom. Although it was supposed to be a big spoiler at the time – cover artist Josh Kirby obviously had instructions to avoid showing just what Aldair and his companions were – it is no secret today that the characters were all animals bioengineered by a far-future humanity into parodies of humanity, and set up to reenact history for the amusement of the decadent human “gods”. Aldair and the other Rhemians (Romans) are pigs; Rheif and the other Stygiann invader tribes are wolves; and there are Nicean (Egyptian) crocodiles, Vikonnen (Viking) bears, and others such as the Cygnian sheep and the Tarconian bulls. Aldair and his companions discover the truth, and fight to break their mental conditioning and live independent lives, not compelled to act out the previous humans’ mistakes. 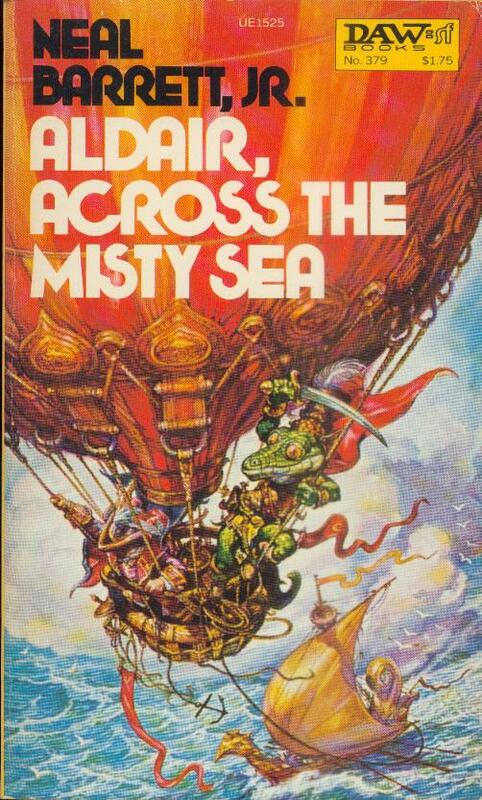 Aldair of Albion was the first novel of a quadrology; the others were Aldair, Master of Ships (DAW Books, September 1977), Aldair, Across the Misty Sea (DAW Books, March 1980; Kindle edition), and Aldair, The Legion of Beasts (DAW Books, January 1982). The four books have to be read in order. In my opinion, they get less interesting and more formulaic as they go along. 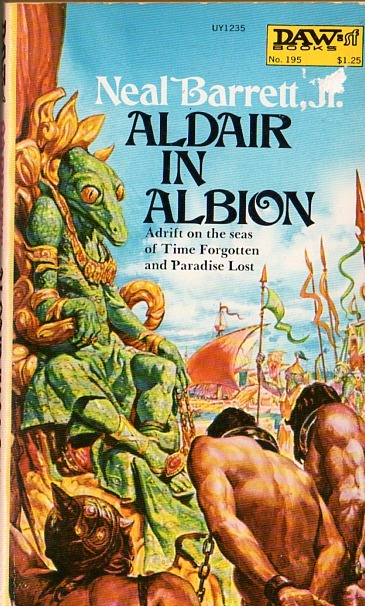 But the first, Aldair in Albion, is a true classic of anthropomorphic s-f and should be read by every Furry fan. All four, plus a new Introduction, are available in an omnibus Kindle edition (and also on NOOK) from Biting Dog Publications of Duluth, GA since June 2012. I love these older sci-fi anthro novels, but I suppose I may have overlooked this one. I spent many years as a kid scouring used book stores, collecting and reading vintage sci fi. 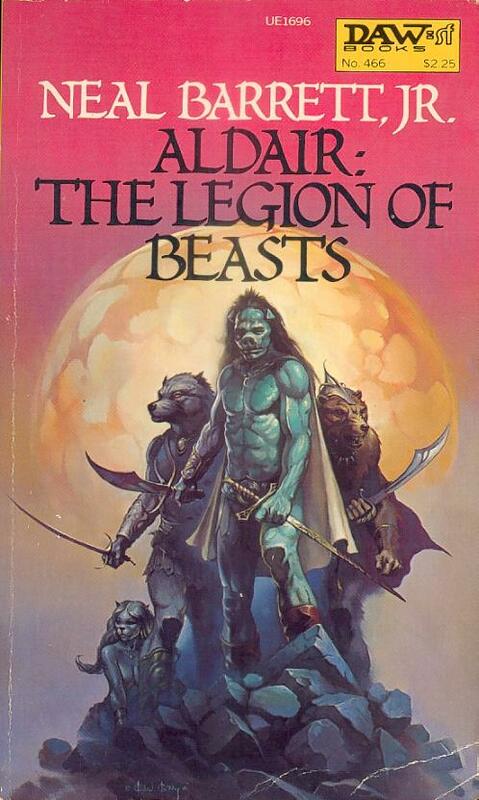 Alan Dean Foster's furry-esque Spellsinger books made a great fun impression when I was 13, 14, 15 in the early 90's. (Were those read by the Gallacci groups?) These days I deal books but don't have time for fun sci fi reading. I have a lot of love for it though. When I saw this title I thought "who?" and looked him up expecting something minor and forgotten (before I read the review). But, he looks like a gem I overlooked. Here's his page. He certainly has a lot of history, a few awards, some great connections, and a love for what he does at over age 80. Long time working genre authors seem to never age in their interests and relationships with what they do. Barrett's The Prophecy Machine and its sequel, The Treachery of Kings, are also worth reading. They are anthropomorphic but not Furry. 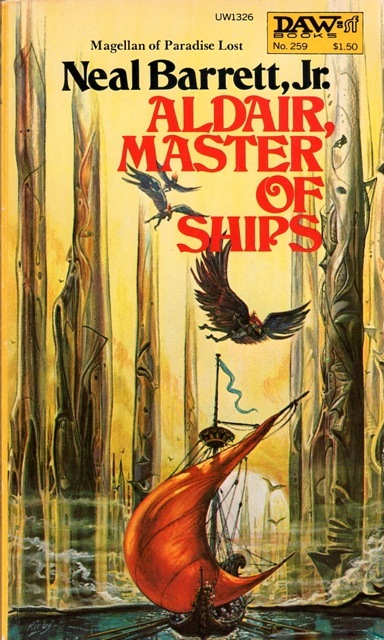 Alan Dean Foster's Spellsinger series did not start until 1983, by which time the Gallacci groups were spending most of their time discussing Don Bluth's The Secret of NIMH movie, the disappearance of Vootie, and the first attempts to self-publish Furry comic books. The Spellsinger books were mentioned as "you have to read this! ", but not talked about much except as an example of how, with Barrett's Aldair books and Foster's Spellsinger books, Furry s-f & fantasy was becoming more popular. I'll definitely have to grab a copy of this on my kindle when I get a chance. I need more furry novels.